Sun-protective clothing with Zinc Oxide. UVA & UVB protection for the lifetime of the garment. Zinc Oxide is safe & skin friendly. It protects from UVA & UVB radiation even when wet. 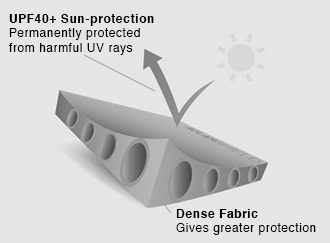 Our Zinc Oxide fabric construction provides UPF20+ sun protection, permanently protecting you from harmful UV rays. Zinc Oxide is also naturally anti-bacterial & creates a cooling effect.